1100hs: Meet Mr. Juan Tabernero at EANA, over mate and some medialunas we discuss about restricted airspaces and air traffic control in Argentina. Flight planning. Overlapping Flightradar.com airspaces and Google Earth satellite imagery in order to assess Aerocene free flight operations. We are authorized to do first aerosolar free-flight in Argentina. We have good weather forecast for wednesday, thursday and friday. Requested the free flight date change for thursday. 1600hs > Arrived at El Durazno, San Luis. We launch Mavic Drone and learn the basics from Tomas. Footage filmed. 0800hs > Arrived at Puerto de Maderos, El Trapiche, province of San Luis. 1000hs > We begin inflating balloons prepared in Berlin for Air-Water-Air Experiments. 1100hs > Explorers and Air-Water-Air balloons fly with GoPro cameras above Dique La Florida. The balloons were fitted with high definition microphones to record the sound of the atmosphere. 1200hs > Air-Water-Air experiments: the Explorers outshined all other balloons on their ability to get wet and quickly rise again. Flight visualization for balloons #aeroceneexplorer AE032, AE034, Air-Water-Air I and Air-Water-Air II. 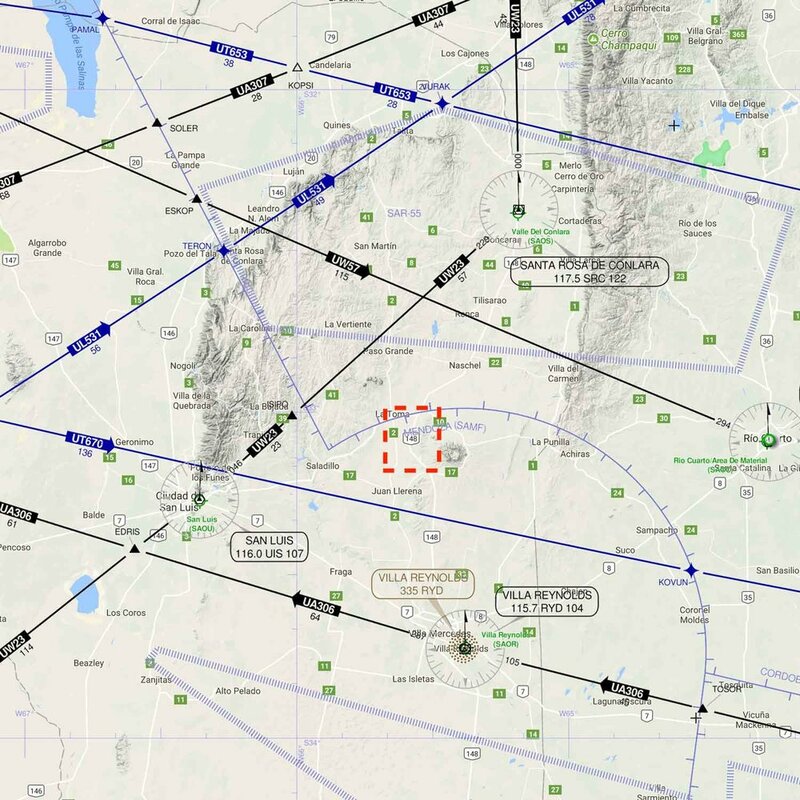 Their flight path data was recorded using a Garmin GPS and then processed with Garmin BaseCamp and Google Earth using the KML (Keyhole Markup Language) format. Due to Google Earth’s topographic model weak accuracy, we had to calibrate the balloon’s path using KML’s altitudeOffset command. An isolated trajectory from the Puerto Maderos flights using Trimble SketchUp software. La Toma > S33° 03’ 18.0" W65° 35’ 53.8"
In the afternoon we move to La Toma to have a go at free flight. 1600hs: We attempt a free flight, there is little wind, our Gemini free-flight sculpture slowly rises, to begin going down. Payload seems to be to heavy for the amount of insolation. We give it another go by running and accompanying the balloon, but it doesn’t take off. We decide to call off the flight and protect the equipment. We reach Eana authorities and receive authorisation for a flight the following day. La Toma, San Luis > S33° 03’ 18.0" W65° 35’ 53.8"
Unfortunately, high wind conditions prevent the balloon from taking off again. We gave our hearts and souls and our take off attempts are filmed by a drone. These are also part of the negotiation proposed by Aerocene, our will to do things and the swinging moods of the atmosphere. Aerocene free flight balloon in La Toma, with the Cerro El Morro in the back, created by volcanic processes 1500 million years ago. We did succeed in creating rapport with Argentina flight authorities, keeping them informed at all times about our activities and complying with all legal regulations. Hopefully the experience gained will be valuable for future free flights (or free floats) around the world, stressing the importance of humanity learning to live in relationship with the Atmosphere in the Aerocene era. An Aerocene Explorer is launched by local community, registering flight path information. Aerocene Explorer flight path visualization with the backdrop of Sierras Comechingones, San Luis.